who will stay in Siofok for the next season? it seems the exodus will pretty much leave the team in a very bad situation. The only miss will be Minko, others are dust collectors... and Siofok will rebuild easily. with Itana Grbic as PM? Siofok is a new-rich club, so they will just buy again a bunch of foreigners...as usual. swarthofole wrote: with Itana Grbic as PM? Yes, when needed... Why not? 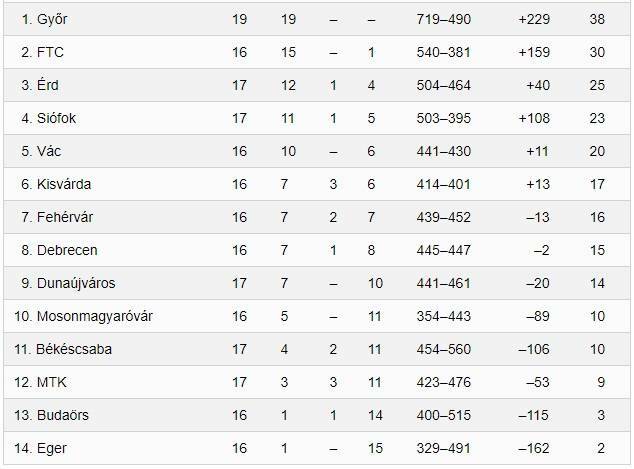 Hungarian league has also poor teams. Dedu, Perianu, Geiger were all bad in Siofok. So their departure is not a big problem for Siofok. but I was not talking only about the Romanians (you should know I am not Geiger's or Dedu's fan ). there were some posts here about the changes on LW, some rumours about Nze Minko leaving for Gyor, Khmyrova uncertain, now the Romanians, so basically they need a new team. and by the way, Perianu was really good before the injury. Sorry it is an error ! The last minute of the game begins at 1:43:33, Siófok leads 24 to 22. Then a new game starts: Arenhart vs Moen. Firstly, sorry for putting this post here. It is misplaced, but I didn't want to start a thread about this. I'm in Budapest on vacation, and today there is Györi vs FTC, and I'm considering the options to go see this game. So I would like to ask the Hungarian fellows here: is realistic to expect finding tickets in site just about the game start time (19:00)? How easy would it be to get back from Gyor to Budapest after the game? Fabbr wrote: Firstly, sorry for putting this post here. It is misplaced, but I didn't want to start a thread about this. There is a single site where you could buy the tickets (https://www.jegymester.hu/hun/Event/610 ... o-Hungaria) but it seems they are already sold out. Still there is not a big risk in assuming there will be scalpers around the arena to sell you ovepriced tickets(or even fake ones). Regarding the travelling the last train coming to Budapest departures at 21:39 so I would not rely on that(traveltime is 1h50m) but with car it would be much more convenient. In Hungary if you want to get to any derby (FTC-UTE in football, Szeged-Veszprém men's handball,etc.) you need to begin the planning earlier. I would suggest to watch it this time only in the TV(Sport1 channel is accessable ppretty much everywhere). Derp, thank you for the heads up. I've read it earlier but could not answer at the time. I gave up at the end. Next time I'll be planning earlier. Thank you for your help, anyway, it is very much appreciated. GYŐR: Kiss É. – KNEDLÍKOVÁ 5, A. HANSEN 5, S. Oftedal 4, Brattset 1, V. Kristiansen 2, GÖRBICZ 5, Leynaud, E. Amorim 1, Groot 4 (1), Pintea 3, Puhalák 2, Bódi 2, Tomori 2. DUNAÚJVÁROS: Csapó Kyra – GROSCH 4, SZEKERCZÉS 9 (4), Szalai B. 3, Sirián 2, Ferenczy 2, Kazai 2, Vártok, Cifra, Nick, Bouti 1, Monori 2, Mihály, Fodor N.
ÉRD: Janurik – KRPEZS-SLEZÁK 7 (2), Lavko 3, TÓTH G. 7, Szabó L. 3, Kovacsevics, C. LASSOURCE 8, FOGGEA, Kiss N., Jerábková 2. SIÓFOK: DEDU – Böhme 4 (2), M. González 5, NZE-MINKO 4 (1), JEZIC 6, Kobetic 5, Aoustin 1, Silje Solberg, Perianu, Janjusevics, Elghaoui 1, Hmirova. GYŐR: Grimsbö – Knedlíková 4, Groot 2 (1), S. Oftedal 3 (1), Brattset 4, E. AMORIM 5, Görbicz 2 (2), Kiss É, V. Kristiansen 3, A. HANSEN 5, Pintea 4, Bódi, TOMORI 4, Puhalák, AFENTALER 3 (1). ÉRD: Janurik – Krpezs-Slezák 5, Lavko 2, Szabó L. 3 (1), J. Kovacsevics 2, Tóth G., C. Lassource 4, Foggea, JERÁBKOVÁ 7, Schatzl Natalie 2, Simon A., Reizinger, Király 1, Gávai, Landi. FTC: Bíró B. – Lukács V. 1, KLUJBER 7 (2), Kovacsics 3 (1), PÁSZTOR N. 4, Háfra N. 4, Schatzl Nadine 3, Szemerey, Horváth D., Pena 3, Faluvégi D. 3, Klivinyi 3, Márton 2, B. Klikovac, Tóth N.
DUNAÚJVÁROS: Csapó Kyra – Grosch, Szekerczés 4 (2), Cifra, Nick 3, Ferenczy F. 2, Kazai 3, Vártok, Szalai B. 4, SIRIÁN 8, Monori 1, Bouti 1, Mihály P.
FERENCVÁROS: BÍRÓ B. – Lukács, Mészáros R. 1, HÁFRA 5, Horváth D., Kovacsics 4, SCHATZL NADINE 5, Szikora, PENA 7 (5) Klivinyi 1, KLUJBER 4 (1), Pásztor N. 1, Faluvégi 2. Last edited by Jig on Mon Mar 18, 2019 9:29 am, edited 2 times in total. FERENCVÁROS: BÍRÓ B. – Lukács, Mészáros R. 1, HÁFRA 5, Horváth D., Kovacsicz 4, SCHATZL NADINE 5, Szikora, PENA 7 (5) Klivinyi 1, KLUJBER 4 (1), Pásztor N. 1, Faluvégi 2. VÁC: Arenhart – JOVETIC 4, Hámori 1, HELEMBAI F. 4, Lakatos R. 1, KÁCSOR 9 (5), Radoszavljevics 1, Bukovszky, De Souza 2 (2), Szabó K. 1, Szamoránsky P. 2, Szondi 2, Diószegi. GYŐR: Kiss É. – BÓDI 4, Groot 4 (2), BRATTSET 7, E. Amorim 3, V. Kristiansen 3, Puhalák 1, GRIMSBÖ, S. Oftedal 2, A. HANSEN 7, Görbicz 3 (1), Pintea, Tomori, Afentaler 1. DEBRECEN: Triffa – Varsányi 1, Punyko 3, TÓVIZI 7, Deszpotovics 2, Grigel, VANTARA-KELEMEN 6, OGUNTOYE, BULATH 6 (5), KOVÁCS ANNA 5, Bordás, Szabó P., Arany, Zamfirescu. FTC: BÍRÓ B. – LUKÁCS V. 3, KLUJBER 9 (2), KOVACSICS 5, Pásztor N. 1, PENA 6, Schatzl Nadine 1, Szemerey, HÁFRA N. 5, Klivinyi 2, Horváth D., Mészáros R., Márton G. 1, Faluvégi D. 1.